This will be a special performance to be held at the Sudbury House Hotel and your ticket will include supper. The production will be co-produced with theGarrison Little Theatre who will be visiting us from Fort Erie, Ontario, Canada. FDS will do two of the plays and GLT will also do two. Our group will then travel to do the same performance in Fort Erie in June 2012. 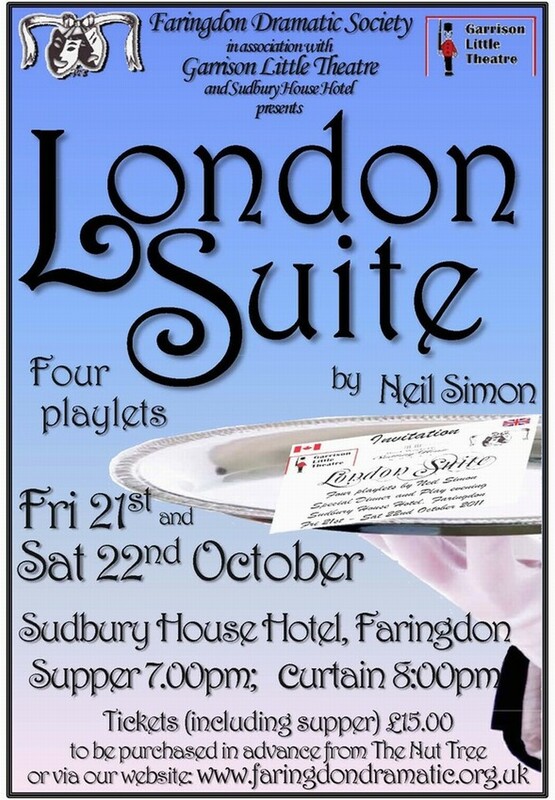 London Suite is a collection of four playlets set in the same suite of an old but fashionable hotel in London. Each story features a unique collection of characters and style, from a taut revue sketch to a sentimental comedy, a comedy-drama, and finally an unbridled farce. Expect Simon’s characteristic comic one-liners, freewheeling sight gags and a sudden ambush of poignancy. Settling Accounts – Welsh writer Brian Cronin suspects his manager Billy Fox of plotting to run off with his money. Going Home – Tells the story of a mother and daughter on a European shopping trip. Lauren convinces her mother to go on a date with an elderly man, even though Sharon is heavily against it. Sidney and Diana – Simon resurrects Diana and Sidney, two characters from his earlier play California Suite, continuing their story in London. A divorced couple, Diana is an actress, and Sidney is now living with his male partner. The Man on the Floor – an American couple is in London for the Wimbledon championships. Their plans are put on hold with hilarious results when Anne loses the tickets, Mark’s back gives out, and they are asked to move because they have accidentally been given Kevin Costner’s suite. If you enjoyed ‘The Odd Couple’ performed in May then this is another one by the same author and not to be missed.